The County Palatine of the Rhine (German: Pfalzgrafschaft bei Rhein), later the Electorate of the Palatinate (German: Kurfürstentum von der Pfalz) or simply Electoral Palatinate (German: Kurpfalz), was a historical territory of the Holy Roman Empire, originally a palatinate administered by a count palatine. Its rulers served as prince-electors (Kurfürsten) from "time immemorial", were noted as such in a papal letter of 1261, and were confirmed as electors by the Golden Bull of 1356. The fragmented territory stretched from the left bank of the Upper Rhine, from the Hunsrück mountain range in what is today the Palatinate region in the German federal state of Rhineland-Palatinate and the adjacent parts of the French region of Alsace (bailiwick of Seltz from 1418 to 1766) to the opposite territory on the east bank of the Rhine in present-day Hesse and Baden-Württemberg up to the Odenwald range and the southern Kraichgau region, containing the capital cities of Heidelberg and Mannheim. 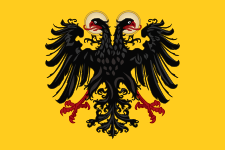 The Counts Palatine of the Rhine held the office of Imperial vicars in the territories under Frankish law (in Franconia, Swabia and the Rhineland) and ranked among the most significant secular Princes of the Holy Roman Empire. Their climax and decline is marked by the rule of Elector Palatine Frederick V, whose coronation as King of Bohemia in 1619 sparked the Thirty Years' War. After the 1648 Peace of Westphalia, the ravaged lands were further afflicted by the "Reunion" campaigns launched by King Louis XIV of France, culminating in the Nine Years' War (1688–97). Ruled in personal union with the Electorate of Bavaria from 1777, the Electoral Palatinate was finally disestablished with the German mediatization in 1803. The office of a Count palatine at the Frankish court of King Childebert I was already mentioned about 535. 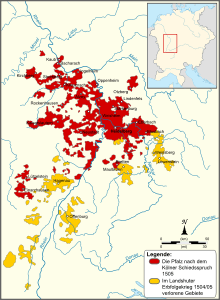 Up to the 10th century, the rule of the Merovingian and Carolingian dynasties was centered at the royal palace (Pfalz) in Aachen, in what was to become the Frankish kingdom of Lotharingia. In 985, Herman I, a scion of the Ezzonids, is mentioned as count palatine of Lotharingia. His territories were centered in the Rhineland proper around Cologne and Bonn, but extended south to the Moselle and Nahe Rivers in (Upper) Lorraine. In continual conflicts with the rivalling Archbishops of Cologne, he changed the emphasis of his rule to the southern Eifel region and further to the Upper Rhine, where the Ezzonian dynasty governed several counties on both banks of the river. The southernmost point was near Alzey. From about 1085/86, after the death of the last Ezzonian count palatine Herman II, the Palatinate lost its military importance in Lotharingia. The territorial authority of his successor Henry of Laach was reduced to the counties along the Upper Rhine, from then on called County Palatine of the Rhine. Various noble dynasties competed to be enfeoffed with the Palatinate by the Holy Roman Emperor, among them the House of Ascania, the House of Salm (Count Otto I of Salm in 1040) and the House of Babenberg (Henry Jasomirgott in 1140/41). 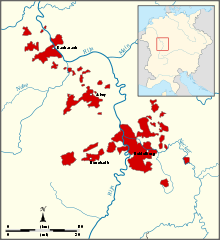 During a later division of territory among the heirs of Duke Louis II, Duke of Upper Bavaria, in 1294, the elder branch of the Wittelsbachs came into possession of both the Rhenish Palatinate and the territories in the Bavarian "Nordgau" (Bavaria north of the Danube river) with the centre around the town of Amberg. 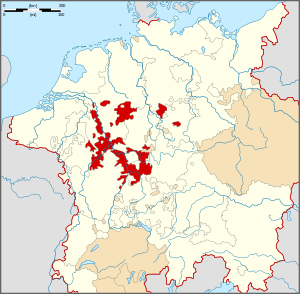 As this region was politically connected to the Rhenish Palatinate, the name Upper Palatinate (German: Oberpfalz) became common from the early 16th century in contrast to the Lower Palatinate along the Rhine. In 1619, Frederick V accepted the throne of Bohemia from the Bohemian estates. He was soon defeated by the forces of Emperor Ferdinand II at the Battle of White Mountain in 1620, and Spanish and Bavarian troops soon occupied the Palatinate itself. Called "the Winter King" because his reign in Bohemia only lasted one winter, Frederick was put under the ban of the Empire in 1623. Frederick V's territories and his position as Elector were transferred to the Catholic Duke of Bavaria, Maximilian I, of a distantly related branch of the House of Wittelsbach. Although technically Elector Palatine, he was known as the Elector of Bavaria. From 1648 he ruled in Bavaria and the Upper Palatinate alone, but retained all his Electoral dignities and the seniority of the Palatinate Electorate. After Frederick V's death, his wife Elizabeth Stuart, Queen of Bohemia, worked tirelessly to have the Palatinate restored to her family and to the Protestant cause. By the Peace of Westphalia in 1648, their son, Charles Louis was restored to the Lower Palatinate, and given a new electoral title, also called "Elector Palatine", but lower in precedence than the other electorates. In 1685, the Simmern line died out, and the Palatinate was inherited by Philip William, Count Palatine of Neuburg (also Duke of Jülich and Berg), a Catholic. 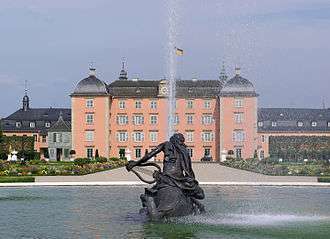 During the reign of Johann Wilhelm (1690-1716) the Electoral residence was moved to Düsseldorf, before being moved back to Heidelberg in 1718 and then to Mannheim in 1720. Johann Wilhelm's mistress, Dorothea von Velen, encouraged him to introduce liberal reforms, most notably the abolition of coverture and the declaration of religious toleration. In 1742, the Palatinate was inherited by Charles Theodore, Duke of Sulzbach. Charles Theodore also inherited the Electorate of Bavaria when its ruling line became extinct in 1777. The title and authority of Elector Palatine were subsumed into the Electorate of Bavaria, Charles Theodore and his heirs retaining only the single vote and precedence of the Bavarian elector. They continued to use the title "Count Palatine of the Rhine" (German: Pfalzgraf bei Rhein, Latin: Comes Palatinus Rheni). Charles Theodore's heir, Maximilian Joseph, Duke of Zweibrücken (on the French border), brought all the Wittelsbach territories under a single rule in 1799. The Palatinate was dissolved in the Wars of the French Revolution. First, its left bank territories were occupied, and then annexed, by France starting in 1795; then, in 1803, its right bank territories were taken by the Margrave of Baden. 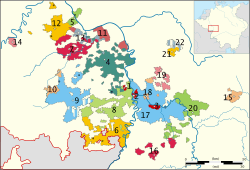 The Rhenish Palatinate, as a distinct territory, disappeared. In 1806, the Holy Roman Empire was abolished, and all the rights and responsibilities of the electors with it. In 1806, Baden was raised to a grand duchy and parts of the former Palatinate including Mannheim became part of the new grand duchy. At the Congress of Vienna in 1814 and 1815, the left-bank Palatinate — enlarged by other territories such as the former Bishopric of Speyer and the free imperial city of Speyer — was returned to the Wittelsbachs and became a formal part of the Kingdom of Bavaria in 1816 in exchange for Tirol, which Bavaria ceded to Austria. After this time, it was this region that was principally known as the Palatinate. The area remained a part of Bavaria until after the Second World War, when it was separated and became a part of the new state of Rhineland-Palatinate, along with former left bank territories of Prussia and Hesse-Darmstadt. 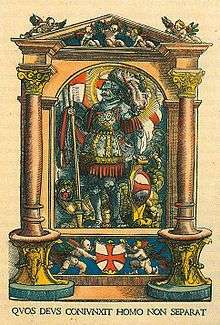 In 1156 Conrad of Hohenstaufen, brother of emperor Frederick Barbarossa became count palatine. The old coat of arms of the House of Hohenstaufen, the single lion, became coat of arms of the palatinate. By marriage, the Palatinate's arms also became quartered with those of Welf and later Wittelsbach. The arms of Bavaria were also used with reference to the elector's holdings in Bavaria. This was extended to quartering of the lion and the Bavarian Arms upon the ascension of Maximilian I to the position of elector of the Palatinate in 1623, used concurrently with the arms shown. The orb represented their position as Arch-Steward of the Holy Roman Empire. ↑ Palatine & Palatinate by Ralph Dornfeld Owen, p. 231. Retrieved 29 Nov 2015. ↑ Kohnle, Armin (2005). "Mittelalterliche Grundlagen; Pfalzgraftenamt, Territorialentwicklung und Kurwürde". Kleine Geschichte der Kurpfalz [A short history of the Electoral Palatinate]. Regionalgeschichte-fundiert und kompakt (in German) (First ed.). Karlsruhe: G. Braun Buchverlag. p. 17. ISBN 3-7650-8329-1. ↑ Siebmacher, Johann (1703). Erneuertes und vermehrtes Wappenbuch... Nürnberg: Adolph Johann Helmers. pp. Part I Table 2. ↑ Diemer, Klaus (2007). "Der Pfälzer Löwe" [The Palatinate Lion]. (German) Heidelberg and the Palatine; elaborate information on history and architecture, illustrated with many pictures.